ConsFor me there are none. ProsProtection. Construction quality. Grip in the muck. Smooth rolling. I use a heavily-laden hybrid on Norfolk's country lanes. Damaged tarmac, mud, thorns and flints. I switched to Marathon Plus Tour on the recommendation of SJS Cycles after using standard Marathon Plus tyres for many years. Let's not get into a debate about tread not being required on bike tyres for tarmac, I'm now firmly in the camp that says it is, because these more open-treaded Tour HS404s are simply wonderful. I had clearance for the widest size and that would be my recommendation if your bike allows. You will be impressed with how they roll. So quiet and smooth, yet forgiving. Schwalbe maximum-level puncture protection. Nothing I know of can give the same peace of mind. The weight of these awesome tyres is irrelevant to me with my priorities. I did briefly experiment with Lite Skin types but they proved way too fussy. No, Tour HS404 are superb. Thanks again for the advice SJS. I could not be more pleased. Bought these for my gravel bike which is ridden almost exclusively on rough tracks. Have the road tyre version on my other bike and have complete faith in their construction and ability to resist punctures. Absolutely bombproof tyres at good price, plus the fast delivery from sjscycles. What more to ask for?! Prompt delivery from stock at a great price. Had in stock just what we wanted. ConsThey are a little on the heavy side but worth the trade off for commuting / touring. I've been using these tyres for three to four years now. I commute on mixed surfaces in all weather conditions and I can't fault them. Obviously no tyre can be 100% puncture proof but I've pulled bits of glass, metal, and thorns out of these over the years and had no punctures to date. I've just bought a new bike and changed the tyres for these as I have so much confidence in them. The price and delivery from SJS Cycles was excellent. I've been unlucky enough to have a couple of punctures whilst cycling to work. A friend recommended this tyre, as he'd been using them for 3 years and never had a puncture. The second I unwrapped it I could instantly tell it was a high quality tyre, and a lot better than the one that came with my bike. It's quite heavy but robust. So far, I'm very happy with it. Bought this tyre on the back of having it before, only reason I needed another is the tread has worn down but after around 4000 miles of mixed surface riding without a puncture I can't complain. I bought 4 of these tyres for an upcoming 6 month tour for my partner and I. I've previously had these tyres on my other bike, 3 tours and daily riding for 3 years, no punctures and perfect rolling.They are slightly heavier than other tyres but for the puncture protection and tread lasting it's more than worth it. Also, one tyre arrived and once fitted had a ballooning in the outter lining. One email later and a brand new tyre without charged arrived the next day. Overall, brilliant tyre and amazing company to buy from. Recommended, without a doubt. Good Value, Quality Touring Tyre. ProsGood construction, easily fitted, good value. I usually fit Continental touring tyres, but quality has declined. First impressions on opening the package were, sturdy construction.This tyre was very easy to fit to my Mavic rims. I have fitted this tyre with a new matching Schwalbe tube, so far so good. I was recommended these tyres by a friend who has used them for years. My previous tyres were Schwalbe Durano Plus and I'd used them since 2012 and only had 1 puncture. SJS cycles were selling them at a very competitive price. They were delivered promptly and well packaged. My third bike now with these fitted on them and never had a flat. If your on the road, gravel path or crossing a grass verge these will safely take you across them without slipping. A heavier tyre but a good trade off for not having punctures or sliding sideways in the wet. Excellent on roads, on gravel, forest/fire tracks, single track, etc. Compound grippy but durable, tread cut for off and on road. Sometimes difficult to put on. Downside is the weight. Rolling weight too. Upside is you can forget about punctures and replacing tyres for a very LONG time. They also have a curious habit of being very slippery sideways when riding on top of road line markings, you can end up a few inches to the left or right all of a sudden. (Maybe that's true for all tyres?) Exercise caution anyway. All in all 9.5/10. (Just the weight lets them down). Have tried the tyres today across our local heath ( gravel tracks) & roads. V.good stability on gravel/sand & excellent rolling performance on tarmac. If I buy this product, do I get 1 tyre in the box or 2? I want to replace both tyres on my bike, but don’t want to order 2 from here and end up with 4 tyres! I have been advised to buy 700 x 38C marathon plus tour tyres for my e-bike. Do you sell these pl? Can I use the 700 x 35 37 - 622 on my 700 x 32c bike? I just don't really understand wat the 37- 622 is. 37 is width of a tire when mounted, 622 stands dia tire bead . 37 is slightly to wide it might rub, it depends on your bike. I currently have Kenda 700x42c (42-622) tyres on my hybrid bike, but the 42-622 size is showing as 700x40c on this page. I assume that while they are a couple of mm thinner that they would fit my rims? Yes these will be absolutely fine. Claud Butler, Odyssey,2017. Wheel rim marked 622x12 ¤t tyre is 700x38c. Interested in Schwalbe marathon tour which doesn’t come in this size. Can i fit the Schwalbe 40c or should i come down to the next size? Many thanks, david. As long as you have room under the mudguard (if fitted) and within the frame, you will be fine to use the 40c tyre. If you are not sure, you drop to the next size. Which Inner Tubes For Marathon Plus Tour 47-622? I currently have Marathon greenguard 40-622 on my e-bike and want to replace them with Marathon Plus Tours 47-622. Which inner tubes do you recommend for them? Thank you. 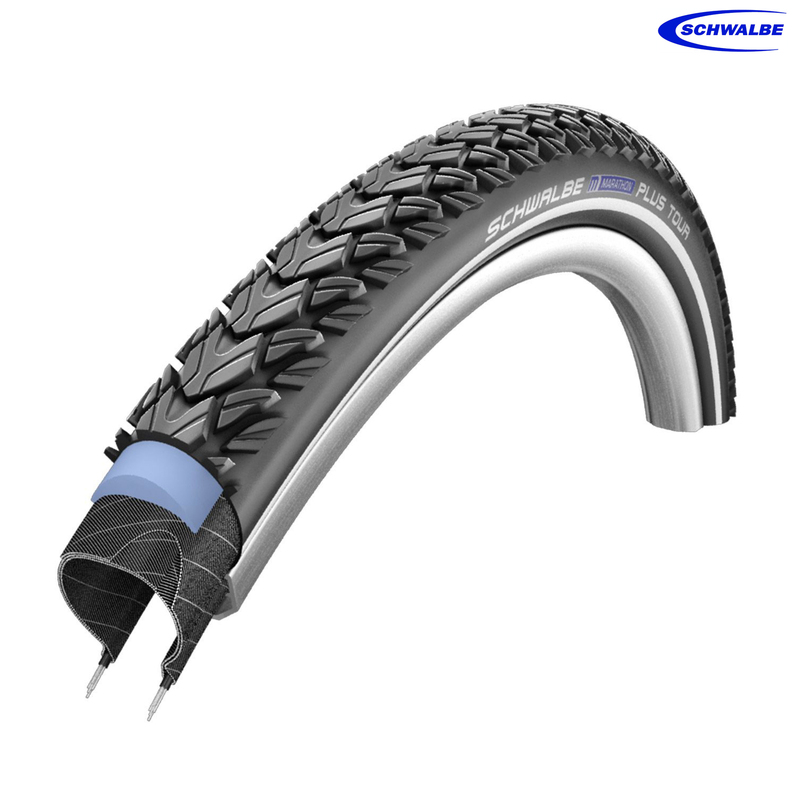 Its the size 17 size of Schwalbe inner tube that we recommend. For Presta valves they are SJSC part number 3830, for Schrader valves they are SJSC part number 3857 and for Woods/Dunlop valves they are SJSC part number 3872. After doing some internet research I can see that your wheels have an internal diameter of 17mm. Rims with these dimensions usually have a wide range of tyres that they can fit normally safely all the way up to 45/47mm wide. As you have a carbon road frame you will need to check what clearances your frame has as this will definitely be a limiting factor on what size tyres you can run. Would these be suitable ? We do sell this Marathon Plus Tour in 26" as well, these are SJSC part number 22423.